OCEAN PHOTOS is a registered trademark of OCEAN PHOTOS S.L.U., a company exclusively dedicated to underwater photography in all its many aspects, including the marketing of photographic equipment and lighting systems for underwater imaging. OCEAN PHOTOS was created in 1997 by Carlos Minguell, professional photographer and three times World Champion of Underwater Photography, and since then maintaining the same philosophy offering businesses and private individuals a high quality global service around underwater imaging, not only by commercialising the most suitable material for underwater photography, but also through training activities and a specialized photographic archive. 20 years of continuous experience back us up in our field. At OCEAN PHOTOS we pride ourselves to be underwater photographers previous than sellers: all the staff has been trained by experienced underwater photographers, fully qualified to guide and assist our customers in which products are the most suitable for their needs. His first steps in underwater photography were with a humble compact camera coinciding with his incorporation in OCEAN PHOTOS in 2007 and since then his equipment, his technique skills and knowledge haven´t stopped improving. 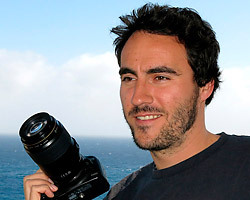 Common competitor in Canary underwater photography competitions, he has achieved remarkable results including first place in Güimars’ and Garachicos’ Open. His evolution through the different formats, from compact to reflex cameras, has converted him into an authentic expert in underwater photography gear. We invite you to consult any doubts before purchasing underwater photography gear: we will be delighted to assist you without any commitment. Feel free to be advised by truly experts in the underwater photography field. OCEAN PHOTOS isn’t one of many on-line stores almost anonymous that are proliferating nowadays. We are delighted to personally meet with you at our local shop. Also, at a time when mostly all national phone calls are free of charge, we don´t want you to be forced to call to a 902. Our telephone number for any enquiry is 922680220. Our opening hours are from 9:00 to 14:00 and 16:00 to 19:00 from Monday to Friday except in July and August, when our summer office hours are from 8:00 to 15:00 from Monday to Friday.